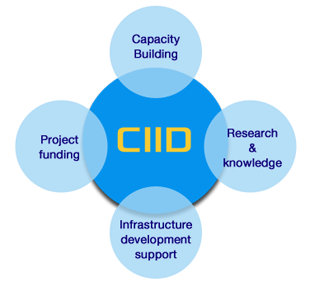 The Commonwealth Association for Infrastructure Development (CIID) has a multidisciplinary approach to improving the planning, financing, implementation and management of infrastructure development. CIID's primary focus is in the Commonwealth, but its outreach is global. CIID focuses on enhancing implementation capability. This is accomplished through exposure to international best practice and through capacity building that creates real ability to plan and execute projects at a local level. CIID is proud that its Chief Executive, David Wright, been invited to be a member of the panel for the session entitled "Avoiding White Elephants when Identifying and Selecting Projects". He has also been invited to moderate the session entitled "Using PPP to improve Correctional Facilities". CIID is delighted also that one of our Jamaica Associates, Ms Jeanette Calder, has been invited to be a panel member of the session entitled "Reaching Greater Accountability in the PPP Process. The event is organized by the Multilateral Investment Fund (MIF), a member of the Inter-American Development Bank (IDB Group), with the support of the National Development Corporation (CND) of Uruguay. PPPAmericas 2015 will focus on scale and credibility: taking Public-Private Partnerships to the next level in Latin America and the Caribbean by improving project preparation and sustainability. PPPAmericas is the leading conference in Latin America and the Caribbean on public-private partnerships in infrastructure and basic services. Public-private partnerships or "PPPs" are longterm, performance-based contracts under which governments hire private companies to finance, design, build, operate, and/or maintain what are traditionally public infrastructure projects. The CIID Newsletter Issue 1, 2015 is available as a free download, with information about recent events, and a review of our forthcoming workshops and activities. CIID has launched its 2015 Course Calendar. The 2015 programme includes much-needed workshops on Public Private Partnerships and global good practice in specialist topics including project identification, business case development, funding, contract management and project management. Our calendar contains infrastructure sector workshops in solar energy; water and waste water management; solid waste management; and tourism and hospitality management. It also includes a workshop designed for government departments on governance and leading with integrity. All workshops are designed and delivered by subject specialists from the CIID team. A detailed calendar has been prepared for Jamaica and the Wider Caribbean Region, and similar programmes are planned for India, Africa and other Commonwealth regions. CIID is an Approved Centre for the ILM Level 7 Postgraduate Diploma in Leadership and Management. Professionals and organisations from both public and private sectors can enrol in CIID's workshops and longer programmes. Please follow this link to download the CIID 2015 Calendar. CIID and the University of the West Indies (UWI), Jamaica have agreed to jointly host a two-day symposium on renewable energy. The event will include speakers from CIID and UWI, and other experts in renewable energy. The focus of the event will be explore mechanisms to increase the deployment of renewable energy in Jamaica and across the Caribbean, and to contribute to the energy self-sufficiency programmes of the governments of Caribbean nations.